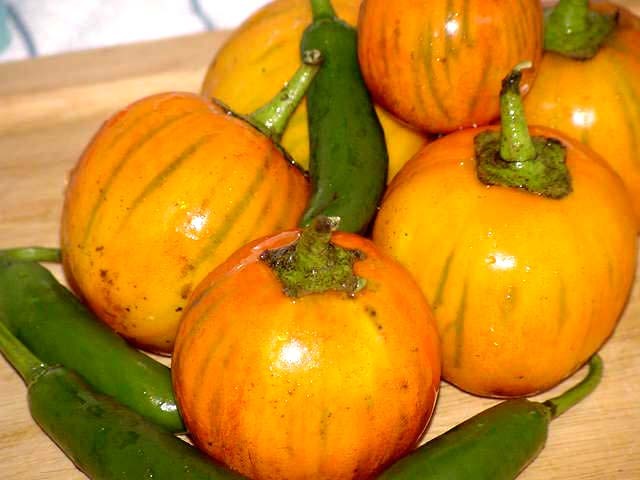 These little gems are called Turkish Eggplant--a variety I had never seen before this Saturday when I ran across them at the Green Market. They're almost psychedelic they're so bright. I saw them and I just had to bring them home. And the serrano peppers are just a few of what I have left after using eight of them to make some salsa. I put one in some pinto beans I made Sunday but I have to find something to do with the rest of them. Putting one into some Turkish Eggplant Curry seemed like a good idea. Ever since I used the Madras Tamarind curry powder last week I've been thinking about how I can use it again, and this seemed like the perfect opportunity. I also had some tofu that was getting too close to my comfort level to the use-by date, so I decided to add that. This time my little pictorial has a happy ending. Cut an onion into quarters and slice the quarters. 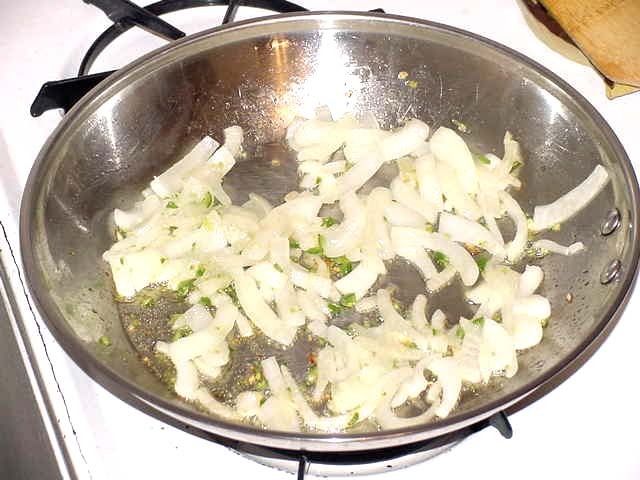 Heat oil in a large skillet and add the onions, followed by a serrano pepper chopped fine. Saute until the onions are soft and golden. Add the eggplant and cook, stirring frequently, until all of the pieces are soft. This means that some of the pieces will start to look like they're disintegrating. That's what you want to happen. There's nothing worse than eggplant that isn't cooked all the way through. 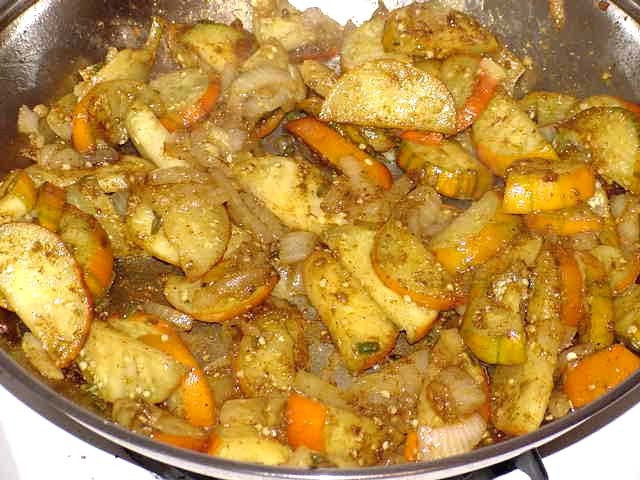 Add the curry powder and cook for one minute more, stirring constantly, to release the fragrance of the spices. Be careful not to burn the spices. Add the tomatoes and stir everything together really well to get all of the stuff up off the bottom of the skillet. Lower the heat, cover, and let it simmer for about 20 minutes. Throw in the tofu and let it simmer for another 10 minutes. Serve over brown rice. 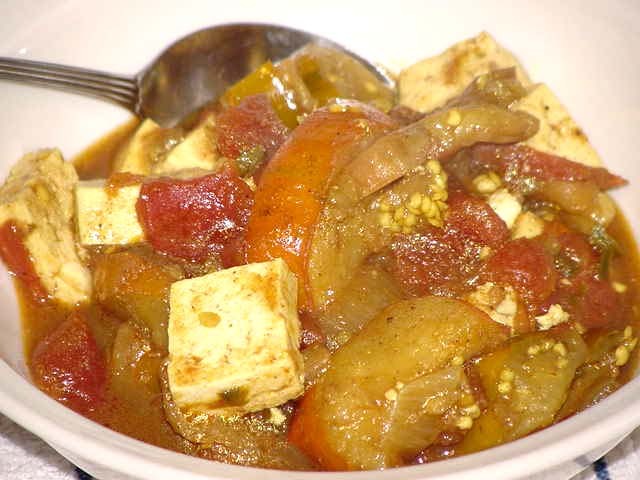 And watch out--with the added serrano pepper, this is one super hot curry! 8-10 Turkish Orange eggplants, halved and sliced. 1 lb. extra-firm tofu with water pressed out, sliced into 1 x 1/2" pieces. Heat oil in skillet. Add onion and pepper and saute, stirring frequently, until onion is soft and golden. Add eggplant and cook for another 10 minutes, stirring frequently. Add curry powder and cook for 1 minute until spice is fragrant. Add tomatoes, lower heat, and simmer for 20 minutes. Add tofu and simmer for another 10 minutes.Serve over brown rice. very interesting, have you ever seen the thai eggplants? Yes, Nicole, I've seen the Thai eggplants and have even bought them once or twice. In my memory, the skins were a little tough and the seeds were kind of hard, but that might just have been the time of season when I bought them. Since I've discovered the joys of currying eggplant, I plan to play with all of the cool varieties that are at the Green Market right now.